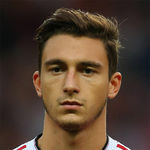 Darmian is such a professional footballer, doesn't moan about lack of game time, trains properly and always puts in a decent display when called upon, hope he will have more game time this season in case we don't sell him in this transfer window. He's italian. I find Italians to be more respectful and down to earth than other people, gentlemans. Decent game other than that tackle he completely sold himself out. Probably trying to steer clear of injury to get his move this month. I picked him for MOTM thought he was great today and when he was striding forward he looked like something might happen. He had some really nice bits of play. He is a brilliant defender to be fair. Shame about his attacking play. He was comfortable on the ball and competed well in the air but he also went missing out of the back 3 numerous times, not his fault as it’s not his position. I would honestly play him next to Victor against Spurs unless Smalling will be fit as Jones is a calamity and always gets done by Kane. Did well today, just Reading though. Becoming fond of this lad. No moaning about lack of game time or not being allowed to leave in the summer, just cracks down and gets on with it. Quite like him as an auxiliary centre back. Afterall, we know he can defend, but he's not the attacking fullback we want him to be. He brought the ball out from the back fairly well a few times though. And he didn't punt anyone in the face or two-foot through anyone's shins, which seems to be a bonus for our calamitous lot. Yep, agreed. I still would sell him at the end of the season and let him get first team football elsewhere, but he does a job for us whenever called upon. Thought he was our 2nd best outfield player today, gotta hand it to him, he's a top pro in how he comes in cold and does solid defensive jobs for us. Granted it was Reading but he looks more comfortable at centre back than he does at fullback where he's mostly been terrible for us. The right side of a 3 man defence is probably his best position. He and Romero were very very good. He's not a wing back and never has been. He can defend though that's why Italian clubs were interested in taking him back. Maybe he can stay here as a CB. MOTM for me. Always does a job when needed, even if he has not played a lot before being called. Deserves better than his current role. It would be funny if we end this season with Lindelof and Darmian as our best CB partnership. Jones and Bailly both can't be depended upon. Smalling is the only one in the way of the most unlikeliest partnership. I'd definitely be keen to see more of him as a centre back in a back four. It can't be much worse than Bailly or Rojo, and to his credit he never seems to be injured, which seems to be a stumbling block for all our other CBs bar Lindelof so far. He's always been a solid defender, it's worth a go. Maybe not against Spurs if actual CBs are fit though. Paolo Di Canio is Italian. I thought he was decent too. Arguably our best player. The rest of them were fecking pants, mind you. Personally i hope if he does play as part of a back 3 it's somewhere else. Probably out best pure defender. He’s Italian ffs. I said in the post-match thread that Darmian did well and could arguably start against Spurs. It seems Ole was impressed too. He's a far cooler head than Jones. Also gave him MOM, steady defender and brought the ball out from the back well with one very nice run forward sticking in my memory. He is a solid full back defensively but does seem to lack that electric burst of pace modern wingbacks have these days. Hes 6ft tall so tall for a full back but shorter than most centre halfs, is he good enough/dominant enough in the air to be a regular centre half? Phil jones is 5,11 but decent in the air but as a pairing they may struggle against a tall attacking team. Mario Balotelli is as well.